The video starts with a panning establishing shot of a cityscape that then follows the height of a tower which could be used how distant the company is from the rest of the world. Which could also be linked to the title of the song which is also on the tower. “Feel good Inc” could be a comparison of marketing for companies of how advertising makes them sound all nice but once you’re inside it changes your perception of them. After the video zooms into the tower it continues to zoom onto the main singer of the band who is sat behind a variety of characters that seem comatose. The main singer then starts the chorus and the rest of the band quickly joins in as indicated by the first few notes of the bass guitar are shown to be played by the band’s bassist. The main singer slowly gets up before getting a megaphone and starts to sing into it which is links the slightly distorted singing. The shots are rather close throughout the piece possibly to show how cramped and claustrophobic the tower is, however the shots are zoomed out after the camera goes back outside the tower. The music also becomes less heavy as it starts to be played by an acoustic guitar. The tune becomes much softer while the images of a floating windmill are on screen. Which is implied the windmill is in the main singer’s imagination because as the windmill goes out of frame, a couple of helicopters come into frame, which then fades back into the tower. After a quick rap verse, which has many quick rotations of the room, the main singer nervously repeats, “Feel Good” which could link to the theme of corporations being scary and lying to the people. As the camera rotates to show the window once more the music starts to lighten again and the camera zooms out of the window to show the floating windmill on a small floating island with a young boy playing the guitar on the end of the island. As the island goes by tower, the boy is seen singing along with the song and the strumming that he is doing is in time with the music implying that this is the main singers dream again because it shows him out of the tower and able to do what he wants. I used my proposal during the production of my piece as it allowed me to check my progress, however I still didn’t get everything that I wanted done as I would of liked to do a fight scene however I ran out of time because I didn’t use my action plan to its full use because I didn’t keep an eye on it and overshot on production. While my initial planning was successful it could be improved by me putting more thought into it because my action plan was quite lacklustre as it doesn’t have much detail which could be the reason that I didn’t use it. I could’ve also managed my time better by putting 100% of my effort into getting the pre-production work done before starting to draw up the images that I would use in my final project as during the preproduction process I often put off writing up blog posts to work on the production process of drawing up the pages. The biggest constraint that I struggled with was my management of time working at home as I should’ve used all or at least most of my available free time to work on my project yet I kept on procastrinating as I felt that I had done enough at college which I now see is a stupid mentality to have and I know I could’ve done better if I had used my time at home more efficiently. The ways that I could’ve planned my research more efficiently could’ve been doing some audience research to discover how people like animations, E.G. Hand drawn or digitally drawn. I could also have analysed more than one animation music video as I only looked at Feel Good Inc. by The Gorrillaz. I did research on the video for Feel Good Inc. by The Gorrillaz and an animated short. I looked at the shot sizes used and the connotations of character clothing, I did this so I could design visually stunning characters to use in my project. I found these sources effective as they are quite different in style which allowed me to compare and create a product that I enjoyed creating. I used my findings to inform creative decisions to decide that I would do the characters in a semi-realistic manner. This is because I liked the stylised character designs from both Feel Good Inc and the other animation that I looked at. This allowed me to justify if proportions looked off, for instance if the hands looked weird or something. I found difficulties when researching such as I wasn’t sure what exactly I was looking for in my analysis of the videos I looked at. This is because I hadn’t done research like this before. To overcome this I asked my tutors to explain what I was looking for which allowed me to understand that I was looking for shot sizes, camera position and implications of certain things. I believe that while I could have done more research into techniques for animation style my product would have been better. I believe that the animation quality could of been improved by learning different techniques or perhaps learning other programs to work in such as Adobe Flash. This could of helped my project as I believe in Flash the fact that I would have to draw each frame would give the production a rough feel which could have worked to my advantage as my project was meant to have a feeling of falling apart slowly however that never came into fruition. The research that I did during the project was mostly design research such as exact colour combinations which allowed em to decide the gradient in the background as well as the potential difference between the background and the foreground. I do believe that if I did more research during the production it would of helped my project as I felt that my project felt a little empty as I didn’t get to finish what I intended to do. I believe while my product is fit for purpose it could have been improved by being longer at which point it could maybe of been classed as a title sequence to a TV show or movie. This could provide more worth to my product as I could make something with less story that could lead into live action footage of whatever the episode is. This could be useful as it also wouldn’t need as much of a narrative like what I was intending to do with my original idea. I believe that I could have improved the technical quality of my animation perhaps by learning some techniques to improve the smoothness of the animation because I believe that the movement of the bike and cars in the final seconds was clunky and could’ve been improved by learning some smoother animation techniques. While I believe that I could of improved on that I also believe that the style that I was going for with the slightly animated comic book style came through and I wouldn’t change anything about the style however as mentioned before in my evaluation I would of liked to made my product longer. I believe that I learned how to animate properly by doing this as my product as I had a vague idea on how to animate but I didn’t know which program to use or how to do it much. I also learnt how to document and analyse my project properly as I wasn’t sure on how I would go about writing down all the stuff that I have thought of. I think that my product does well to appeal to my target audience as I was aiming for late teens which I believe would like my project as it is a vibrant piece of work that, I think, catches the eye which would be useful as the chances that teens are watching television or watching music videos is rather high which would fall under what my project could be classed as. It could possibly not be fit for my target audience as while it has visuals it doesn’t have any extensive action and it is rather still. This is because the design choice to animate less and use a comic book style might not appeal to everyone. I did only a small portion of audience research before production but I learned that simply just animating the comic cells would be too simple and it was suggested that I animate small parts of the comic such as the cars & the titles. I believe that this monumentally helped my project as it added energy to the piece where as before it was rather lacking in that respect. I unfortunately didn’t get any audience feedback on the final product as I didn’t have enough time to get feedback and write up this evaluation. I believe that my peers would have insight that could help me improve my work however I am going to guess that they would most likely say that it was too short, which is a topic I have addressed within this report. I also didn’t get any feedback from an industry practitioner because again I didn’t have time and also the fact that I couldn’t think of any that would take the time to look at it. While I didn’t find one I understand that their professional opinion would’ve helped me greatly they would of been able to tell me what was good and what I could improve on. My product adheres to media law and ethical guidelines as it doesn’t contain any disturbing content and doesn’t have any mention of drugs or violence, however I did intend to add a fight scene into the project but I ran out of production time. I believe that it follows professional standards as it reaches it’s intended audience, follows codes and conducts and also does mostly what it was intend to do. If I was to my production again I would improve my time management as I messed up with that and ran over with my pre production which had a ripple effect on my production time. I could’ve improved my research by doing a little audience research during the project to see if it was well received, it’d of also help me to make the product longer if I was to do this again as I am disappointed with the current state of the length of my work. I believe that I could look up different ways to get around the problem of animation if I did this project again as I found it rather difficult to figure out how to get my hand drawn images into the final project. I am thinking of doing a music video or at the very least using a bit of a song. I want to create something with a 1980’s pop culture vibe as I believe that that atmosphere is exciting and I believe I can make a good product out of it. 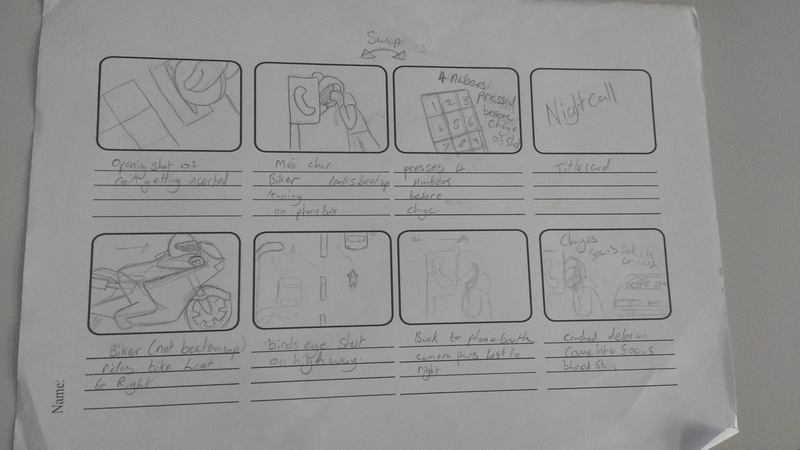 This is my storyboard for my final project. I intend to try to make my project as close as I can to the storyboard. This is my character design for my final project. I intend for there to be a fight scene in my piece so I needed to create a character that is visually different and distinct from the other characters. There may be some legal issues with me using the song Nightcall, this is because it is copyrighted and I may come under fire from lawyers for using the song without permission. 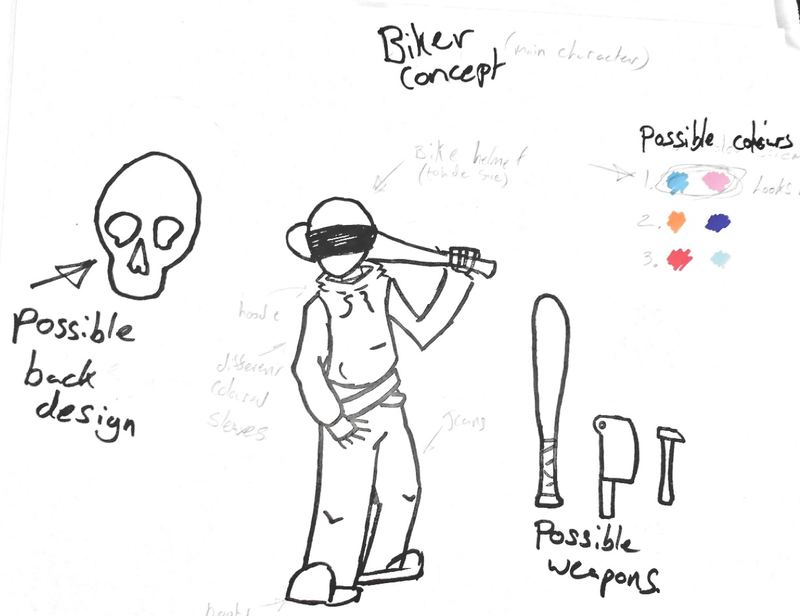 I could also come under scrutiny for using the concept of Hotline Miami which is a game that uses a very similar style and is what I am basing my idea off. However because I am not directly re-uploading the song and the product I am making is trans-formative in nature it falls under fair use. This means that I cannot be sued because I am not just taking the video and reposting it. Even if I did, because the YouTube copyright system is broken, it would not really affect me as I am not relying on the revenue from this video. This video wouldn’t be put on TV simply because I won’t be able to make an animation for the whole song, so it wouldn’t be able to be put on like MTV or something. The violent themes that I intend on using would also prevent it from coming on before the watershed which prevents graphic content airing before 9 PM.